Chillingham Castle came into the ownership of the Grey family of Wark around the time of the 13th century. In the 17th century, the North and South fronts of the castle were redesigned by Inigo Jones and in 1828 formal gardens were designed for the castle in the Italian style. After 1980, Sir Humphrey Wakefield, an English baronet purchased Chillingham Castle and he had a special interest in it because his wife Lady Wakefield is a descendant of the Greys herself. The castle contains many notable rooms including the Edward I room, the banqueting hall, the James I drawing room and the castle library. These are ancient and historic rooms. On the darker side, Chillingham also contains a mediaeval torture chamber complete with rack, nailed barrel, spiked chair, thumbscrews, iron maiden, cages, branding irons and many other nasty devices. There is even a real dungeon and through a trap door in the floor the skeletal remains of a child may be seen in the vault below! Possibly the best-known ghost from Chillingham Castle is generally referred to as the 'Blue Boy' or the 'Radiant Boy'. He has been most commonly sighted in the 'Pink Room' which is actually part of the private apartments of the family in residence. It is said that on one occasion as the clock chimed midnight, the haunted cries of a suffering child were heard coming from a spot near to a passage cut through the 10 foot thick wall into the adjoining tower. A blue light is said to have then appeared close to an old fourposter bed followed by the occupant catching sight of a ghostly young boy all dressed in blue and surrounded by the light. He is said to have been dressed in the style from the period King Charles II. During the 1920s, restoration work caused the wall to be opened and inside the bones of a young boy were found along with scraps of blue dress! The bones were taken away and given a Christian burial in a nearby churchyard and apparently the Blue Boy stopped appearing after that although people are said to still see unusual flashes of blue light in the room in the dark of the night. 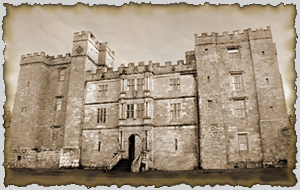 Another well reported ghost at Chillingham Castle is that of Lady Mary Berkeley who was the wife of Lord Grey of Wark. The latter is supposed to have runaway with her sister Lady Henrietta causing a great scandal during the reign of King Charles II. Possibly her ghost is still trying to find her unfaithful husband. At any rate she was left alone, deserted with only her child as a companion and to this day there have been many reports of the rustle of her dress as she is said to move along the corridors in a desperate search for her errant husband. There is an inner pantry at Chillingham in which traditionally, the Tankervilles silver was stored. As it was very valuable, a Footman always slept there to guard it. After retiring to bed one evening, the Footman was confronted by a very pale lady in white who asked him for a drink of water and naturally thinking she must be a guest of the castle, he turned to go get a drink for her. When he turned back, she had disappeared and he suddenly realised of course that he was locked in the inner pantry and that no one could possibly have entered! Even in the library at Chillingham, many people have reported hearing male voices talking or whispering when there is no one in fact there. The more people try to listen to what voices are saying, the more the voices disappear. All of these ghostly appearances and occurrences along with many more have led people to dub Chillingham Castle: 'The Most Haunted Castle In Britain'!